Being in the Real Estate business, we know how big of an investment your home is. We also know the work you put in and the pride you get out of your house. We’re homeowners too, so we understand how much it means both emotionally and financially. So, it’s important that we all know how to protect this massive investment from natural disasters. And, with the devastation we’ve seen recently from Hurricanes Harvey and Irma, as well as our own dealings with storms in the past, we believe you can never be too ready. 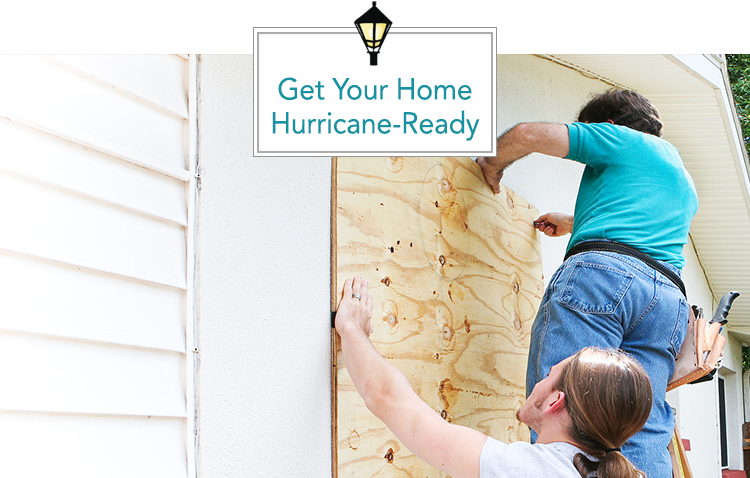 Today, we’ll give you a few tips on how to prepare your home for a hurricane. Hopefully, you’ve never had to figure this out for yourself, but storms can cause a ton of damage to your home. It’s incredibly important to understand exactly what’s included in your homeowner’s policy. Do you have flood coverage? Does your policy cover the cost of a full rebuild? Also, make an inventory list of exactly what you have in your home. This will be of great value if your home does incur any damage. Your roof can potentially become the largest entrance or opening into your home. Make sure it doesn’t become a giant doorway welcoming in the elements. We’d recommend having a professional come out to ensure all your shingles are up to par and you don’t have any leaks. A strong roof will go a long way toward ensuring your home makes it through the storm. While you’re up there, make sure your gutters are clean! Next in line on your importance checklist are your windows and doors. Check to make sure that your windows and doors don’t have any leaks and have a sufficient sealing. For extra precaution, it’s always a good idea to board up your windows and doors with plywood to ensure that glass doesn’t break and they maintain their integrity. This is good practice in general as well-sealed windows and doors can drastically improve the temperature in your home as well as the size of your electric bill. Final pro tip: don’t forget about your garage door! Strong storms like the ones we’ve seen recently can cause garage doors to blow in or up if you have an attic above. Like boarding up your windows and doors, you can go the extra mile and re-enforce your garage door with wood beams or a garage door brace. Here in the South, we love our yards. This means we typically have a wide array of landscape, patio furniture and lawn ornaments. While this looks great and makes for a great place to spend time outdoors, it can cause a lot of problems during a hurricane. Clear out any items that can be picked up and tossed by strong winds. This includes furniture as well as limbs and dead trees outside of your home. Whether you choose to have one professionally installed, or you simply opt for the portable variety, a generator can get you through many a days in case you lose power from the storm. You’ll be happy you can skip the candles and flashlights. For a guide on what to buy and why, click here. For all of your home needs, contact your LOCAL expert at Gardner Realtors today!